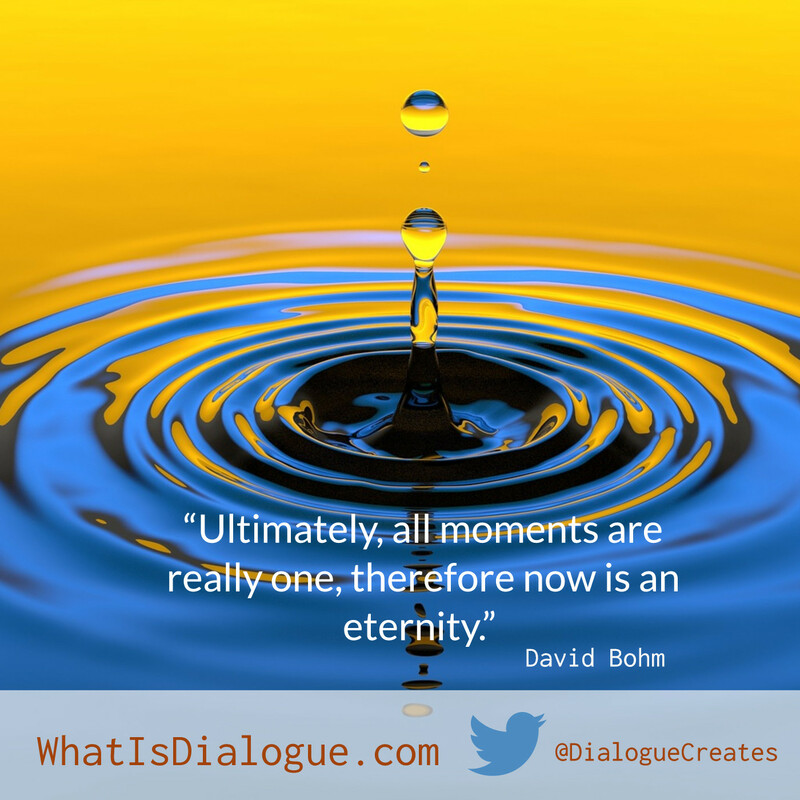 All Moments Are Really One - David Bohm - What Do You Think? Throughout his life David Bohm gave hundreds of lectures and talks in an attempt to not only share his thinking on Thought and Dialogue but to engage his listeners in thinking about these ideas deeply and then to share and question their own thinking, with others. Bohm’s appearances where a catalyst that created and expanded the Dialogue movement that we have today in both small groups and large businesses. If we were in a room together, preferably a physical room but a virtual one would do in a pinch we could explore what Bohm may have meant when he said “all moments are really one.” We surely could come close to deciphering his meaning though we’d most certainly fall short of it exactly, and that would be ok. The process of Dialogue by itself can be as important if not more important than any conclusion about reality we may in a moment of group clarity cast in certainty. What do you think? A Zen student may ponder the meaning of Bohm’s quote with a series of questions. Does he mean there are no moments? Is he saying that time is continuous? Where can I find a cookie? The poor Zen student is approaching it as if it were a puzzle when really it’s much simpler than putting together a thousand piece jig-saw puzzle on a rainy Saturday afternoon with your annoying brothers and sisters. Maybe looking at it while hanging onto past ways of figuring things out is merely a trip down assumption lane. Am I right? or Am I wrong? Or? What Does David Bohm Mean? Part of a quote from Physicist David Bohm can be puzzling – do you know what he means? If you are interested in Quantum Theory, Dialogue or Thought you probably are at least passingly familiar with Physicist David Bohm. On December 20th 2017 we will celebrate the 100th birthday of David Bohm. Listening to Bohm is not a walk in the park but requires us to focus, to at times rewind and pause to think about what he's saying. How else could we hope to gain an understanding of Thought, Dialogue and Quantum Theory? It's well worth the effort I assure you. The above Dr. Bohm Video shared by Reza Ganjavi (www.rezamusic.com) for educational, non-commercial purpose only. This is a great interview with Dr. David Bohm, the great physicist and colleague of Albert Einstein & Jiddu Krishnamurti. David Bohm gives a very engaging interview that covers a myriad of topics yet centers around "Thought." Interview with David Bohm at the Nils Bohr Institute in Copenhagen, 1989. David Bohm gives a very clear talk on dialogue, nonduality and thought. Bohm also takes questions from the audience. This is an audio interview that took place on the New Dimensions radio show on the NPR radio network. He talks about how our assumptions and thought create our view of reality. Corey Anton: : Summary /Overview of David Bohm's book "On Dialogue"
A brief and loose summary of Bohm's wonderful little book.On Dialogue..
A look at how David Bohm sees Thought and Observing Thought in his great little book On Dialogue.